It’s been a bizarre series, demonstrating that momentum is but the frailest of illusions, as each side has lurched back and forth like a Punch and Judy set in receiving and handing out beltings. Basically, we’ve been watching two sides that aren’t very good. With about five reliable performers between the central 22, the rest have collapsed into a mud-wrestle of competing incompetence. It’s not that they haven’t tried, it’s that they haven’t known how to succeed. It’s been like a high-school drama class trying to stage Carmen in a packed opera house, live horses and all. England came away having collapsed one time fewer than Australia. Congratulations, you win this really unreliable car. That primacy was based on a few spells of top-notch bowling in English seaming conditions, a couple of hours of inept Australian batsmanship in the same, and the lone talent of Joe Root, who acted as the binding glue on the crumbling plaster fresco of England’s batting order. 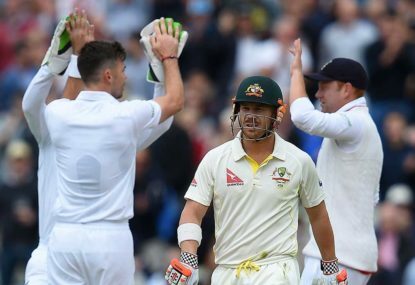 For their part Australia used scoreboard pressure to squash England in the two matches when they batted first and batted big, but were squished themselves the other two times they batted first. Only Chris Rogers dealt with the moving ball, and Cricket Australia will have to find a way to give players time in county cricket to have any hope in four years’ time. As for their vaunted bowling, it couldn’t rein in England when it mattered. Dan Brettig’s last book analogised the 2006-07 England Ashes team as an army preparing for the last war. This time Australia’s management was guilty of the same. The presence of Patrick Cummins in the squad – so undercooked that he could have been pizza dough – tells all you need to know. With visions of the 2013-14 Ashes and the home World Cup, Australia arrived with the same simplistic plan of blasting England out. The problem is that dynamite and matches don’t tend to work so well in the wet. Britain’s natural moisture dampened the squib, and Australia never achieved ignition. Mitchell Johnson was his old self in bursts: a day at Lord’s, an over at Birmingham, but overall a disappointment with well under half the wickets of his last Ashes. Josh Hazlewood couldn’t find his groove on local tracks and faded as the series went on. Mitchell Starc’s MO was set from the Essex tour match: five and a half hours of spraying the ball short and wide and high and wild, then half an hour of stumps flying to the tune of six wickets. Once the Tests began he sustained the former mode but rarely the latter. He was looked to as the spearhead but couldn’t break the skin. He led the Australians for wickets, but that tally of 18 was mostly made up of two bags that look good on paper but mean nothing. In Cardiff he took 5-114 but England still romped to 430. At Trent Bridge his 6-111 didn’t keep England from a declaration at nearly 400 and an innings win. A good bowling average is in the 20s, but that includes the best days and the worst. To dominate an innings a bowler needs to strike at well below that mark. Admittedly Australia could have picked an attack of Laker, Trueman, Gandalf and Rambo and it wouldn’t have helped in a match where they were rolled for 60 batting first. But Starc totalled two wickets across Australia’s two Test wins, and three at Birmingham where salvage was possible, even if unlikely. No doubt he’ll be better for the experience, and his potential upside remains high. It’s just a matter of how long it might take to realise that in the Test arena. Coupled with Hazlewood, Cummins, James Pattinson, Gurinder Sandhu, Nathan Coulter-Nile and the rejuvenated Peter Siddle, Australia’s fast bowling looks well set for the years ahead. Nathan Lyon, if he stays fit, is another reliable component. The top seven is another matter. Peter Nevill has just replaced Brad Haddin. Ditto Mitchell Marsh for Shane Watson. Adam Voges is newly arrived. Rogers is gone. Michael Clarke is gone. Replacing them, the nation barely has a batsman who has a first-class average over 40. Of those who do, Mark Cosgrove isn’t judged to have the physique, Cameron White has been and gone, Matthew Wade is a peripheral wicketkeeper, and it’ll be a cold day in hell before Darren Lehmann recalls Ed Cowan. David Hussey is miles ahead of everyone, averaging 52, but 38-year-olds don’t make Test sides. The best chance lies with Joe Burns, who debuted last summer, and Chris Lynn. Outside that group, Usman Khawaja is the other obvious chance, making his way back from a knee injury, recovering form and captaining Queensland and Australia A.
There’s talk about Cameron Bancroft, Jordan Silk and Nic Maddinson, but none has yet entered a compelling argument. Marcus Stoinis is in the ODI squad for the upcoming series against England, but has a stronger first-class record. Callum Ferguson is a relatively sprightly 30. Or if they go back to the senior route, Michael Klinger has just turned 35, and like Rogers, has been a prolific recent scorer in all formats. Many options, all of them gambles. The way forward for Australia is not known. Their Ashes opponent has a much clearer future. England may already be turning nervous eyes towards a meeting with Pakistan in the United Arab Emirates – the green team is formidable in that part of the world, and with little spin nor capacity to play it, England could find their trip as embarrassing as Australia’s there last November. But in the main, England have won the Ashes with a largely young team that could largely be together for a long time to come. An opener must be found – Alex Hales, probably – and Ian Bell may not have much time. But a refreshed Alastair Cook now has captaincy miles left in him, Root will only get better, Gary Ballance will be back at first drop before too long, and there is a potentially incredible axis of batting power in Ben Stokes at six, Jos Buttler at seven and Moeen Ali at eight. England’s seamers have shown they can cover Jimmy Anderson, with Mark Wood coming through and Steven Finn coming good. After three Ashes series in two years, it will now be two and a half before England next visit Australian shores. Time then to breathe a sigh of relief. England’s team could by then be a cohesive outfit. Australia’s team could be anything. With any luck, by that stage both sides will have grasped a little more firmly how to go about this cricket caper. This article was first published on Wisden India.